Summary writing isn’t the easiest skill to master. It takes a decent amount of time and practice to be able to craft an effective summary. Students need to be able to summarize all types of texts, extracting only the main ideas and key details. 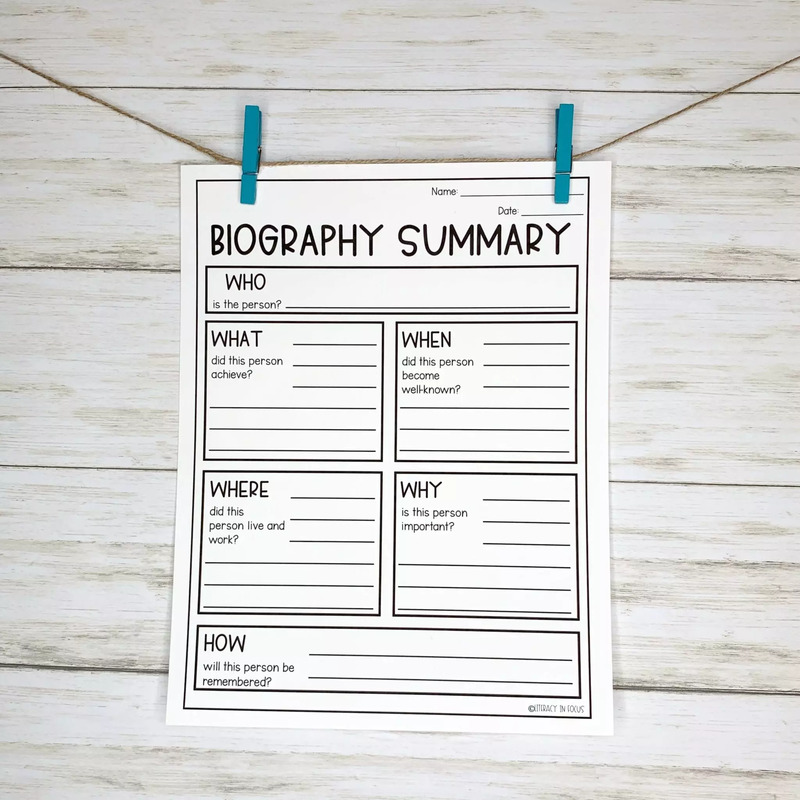 Students often struggle with selecting the correct amount and portions to include in their summaries, which can quickly snowball into a complete re-writing of the entire text they are trying to summarize. Utilizing a graphic organizer will help students narrow down and focus on the appropriate information. The inherent scaffolding a graphic organizer provides sets students up with a framework for picking and choosing content. 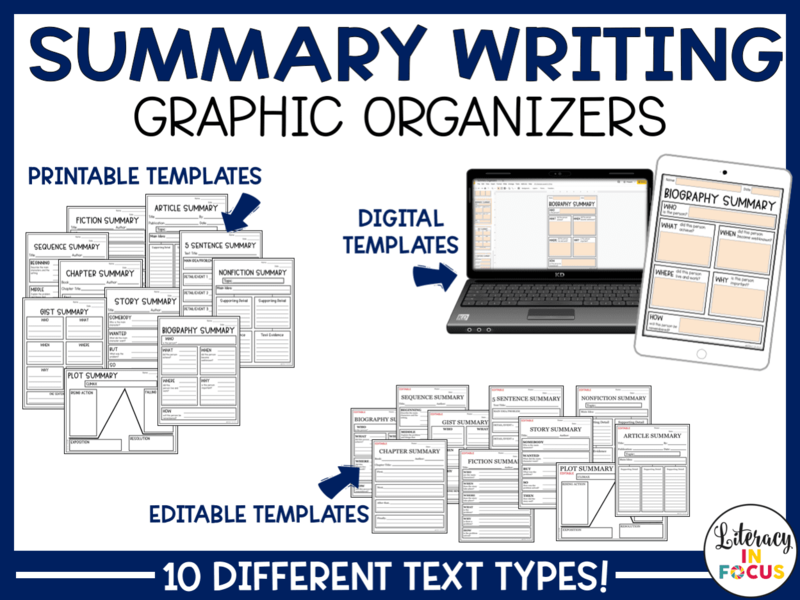 Ten different types of summary writing graphic organizers are detailed below. Each template focuses on a different type of text. 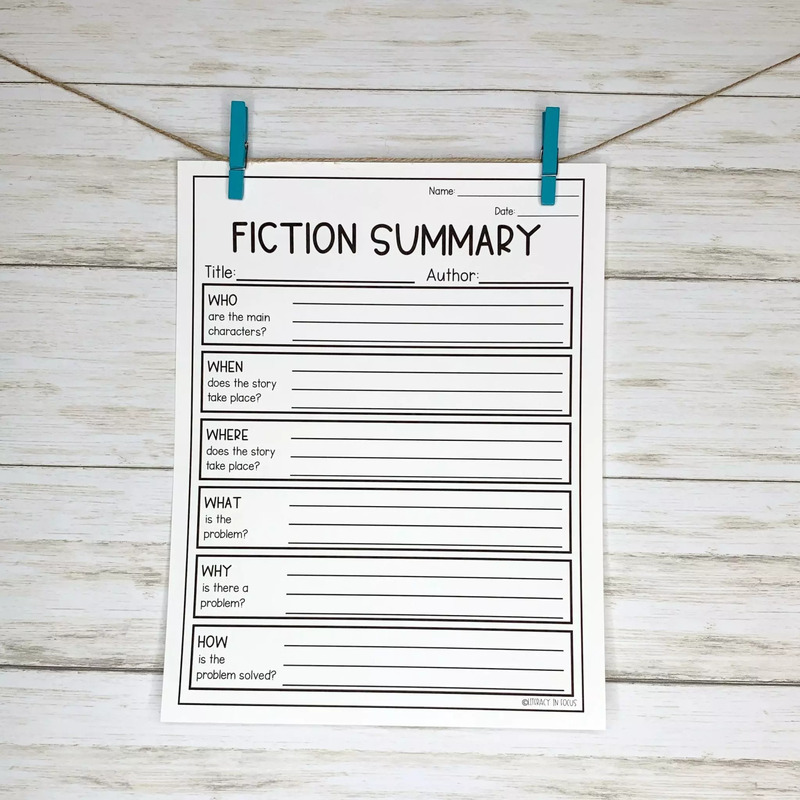 Summarizing fictional text most often requires students to identify the main characters, the setting, the conflict, explanation of the problem, and how the problem is resolved. Using a graphic organizer to break down the plot in this manner helps students focus on the pertinent information and avoid extraneous details. 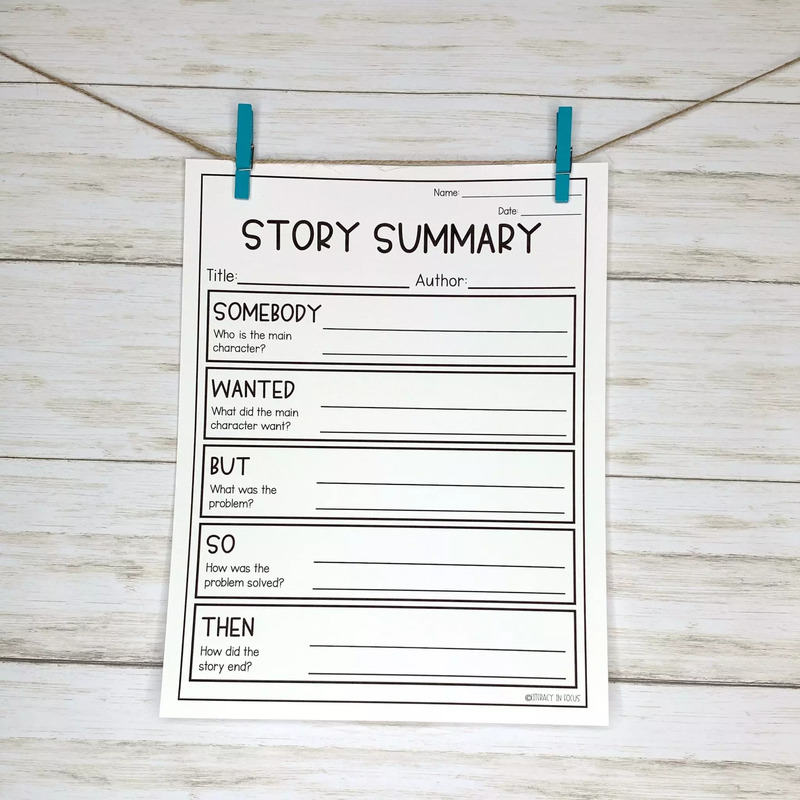 An additional way to set up a graphic organizer for students to summarize a piece of fiction is to guide students by using the words “somebody”, “wanted”, “but”, “so”, and “then”. As shown below, each word can be broken down even further. Somebody: Who is the main character? Wanted: What did the main character want? Then: How did the story end? 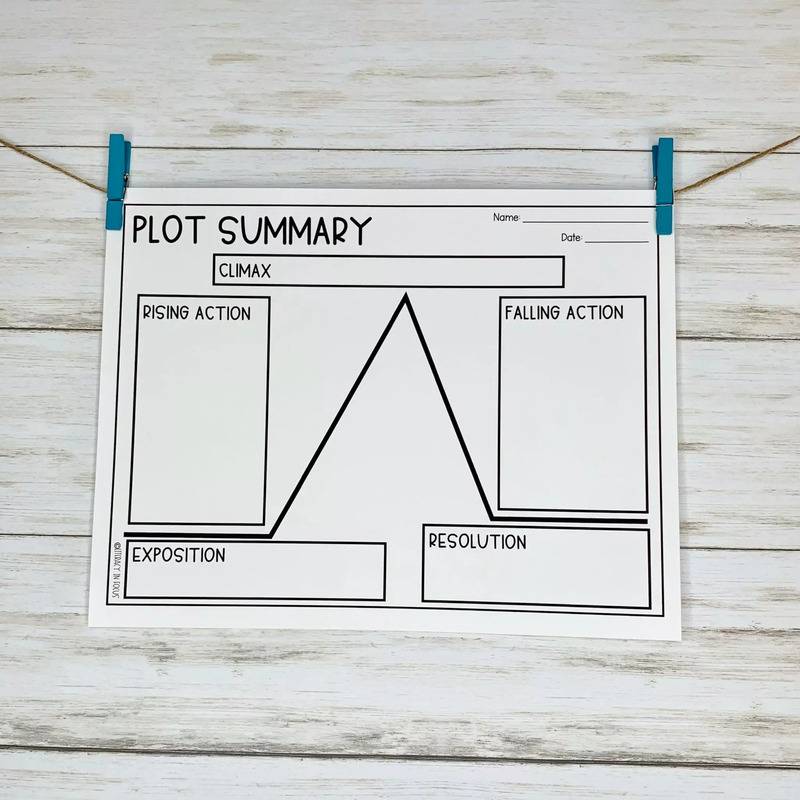 Crafting a plot summary is simply a plot diagram in written form. Students start with the exposition, identifying the main character and setting. Next, students move to the rising action where they record the problem and events relating to the problem. After recording the rising action, students identify the climax, or the point in the story where the problem is at its highest point of tension. Following the climax, students record the events that move the conflict toward a resolution, also known as the falling action. Finally, students are ready to record the resolution. Using a plot diagram as a graphic organizer provides students with an excellent visual representation of the summary. Summarizing a book chapter requires students to practice sorting events in chronological order. Setting up the graphic organizer in a way that moves students progressively forward in time works well. 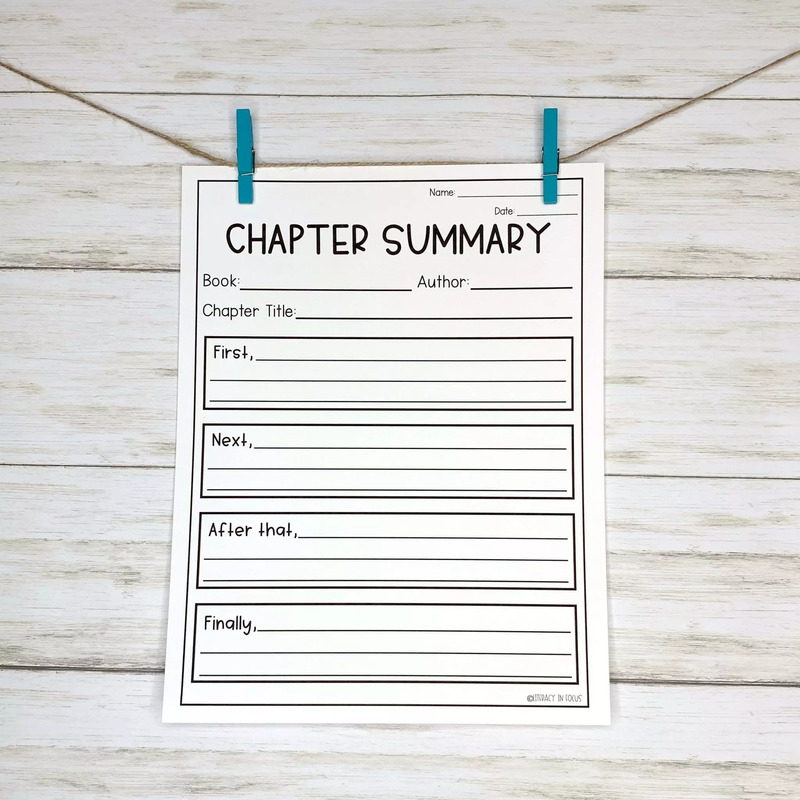 Additionally, incorporating transition words such as “first”, “next”, “after that”, and “finally” will help to keep students on track and focused on major content included in the chapter. 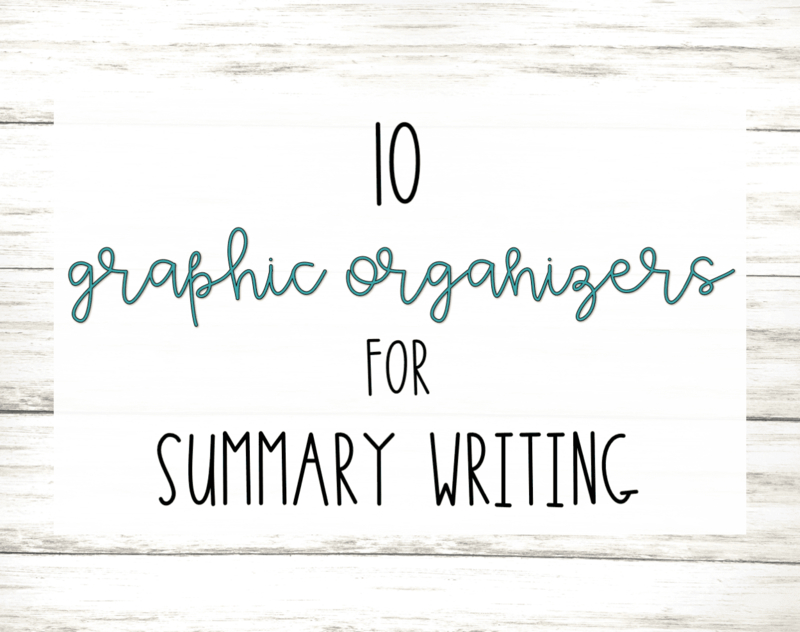 Want all of the graphic organizers detailed in this post? Click here to download them now from Literacy in Focus on TpT! The ability to sequence events in a text is a key comprehension strategy, especially for narrative texts. 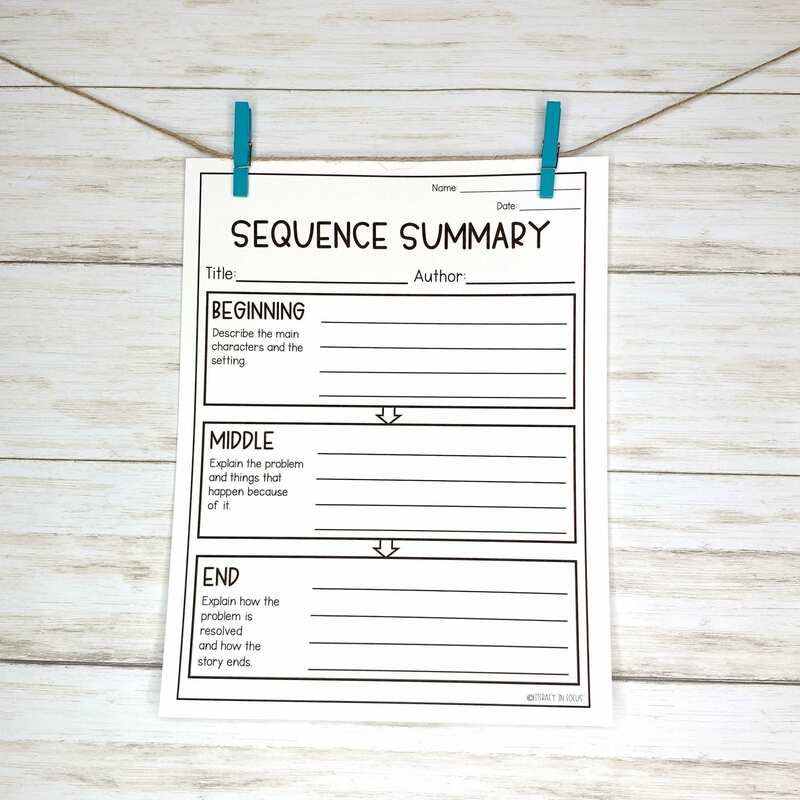 A sequence summary graphic organizer follows the sequence of events laid out in the text. Students are guided through the beginning, middle, and end of the story with a series of prompts. Beginning: Describe the main characters and the setting. Middle: Explain the problem and things that happen because of it. End: Explain how the problem is resolved and how the story ends. 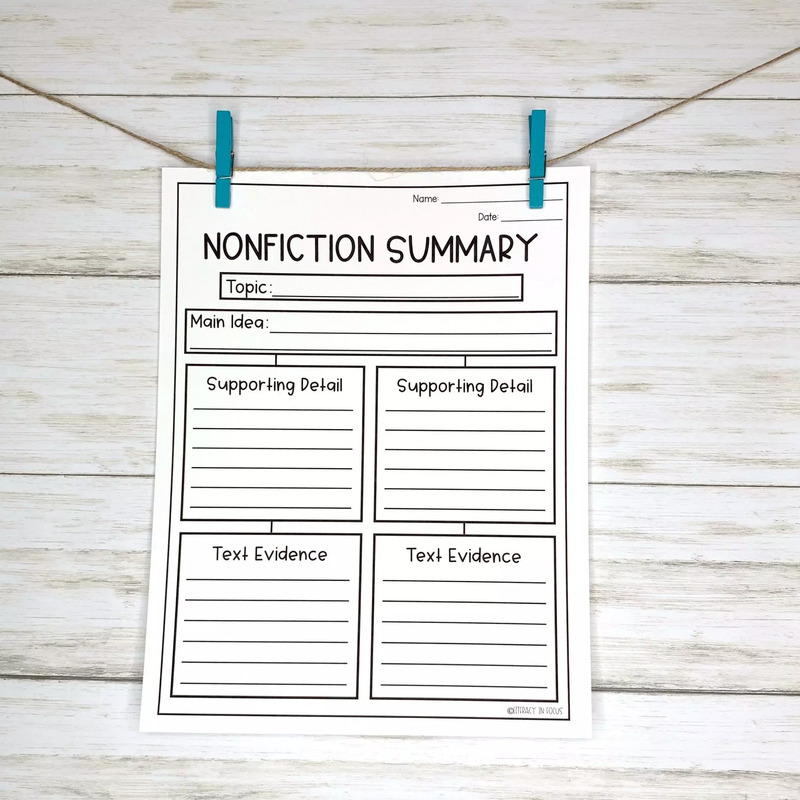 When summarizing nonfiction or informational text, we want students to be able to identify the topic, main idea, and supporting details. Students should also be able to provide textual evidence for each detail. A graphic organizer will help to scaffold students through the entire process. Ideally, students will understand that each piece is a more focused version of the last. When did this person become well known? Where did this person live and work? 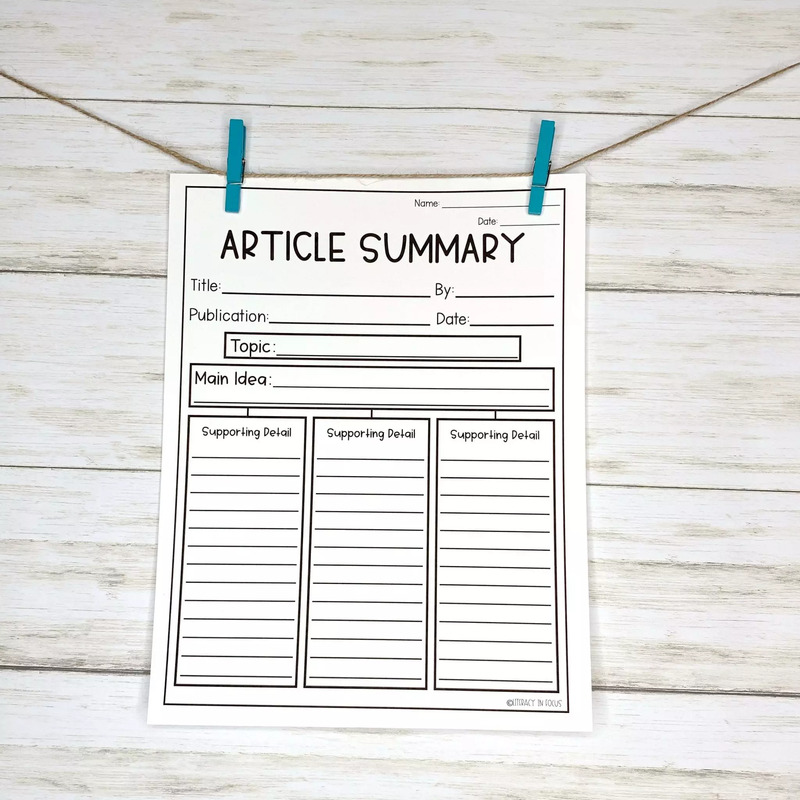 Aside from including the article title, author, publication, and date, it is important for students to be able to identify the topic, main idea, and supporting details. The graphic organizer should start with the main idea and narrow down from there. That way, students will be guided in the right direction. 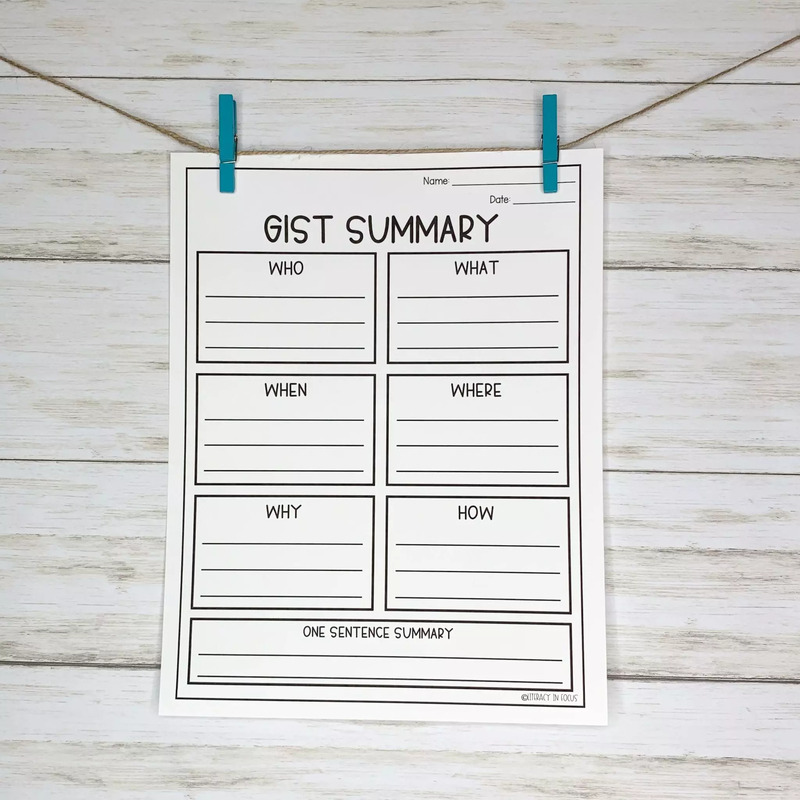 A GIST summary requires students to paint a broad picture of the text. Students will identify and record who, what, when, where, why, and how. Next, students use the information recorded for each of the 5Ws to craft a one sentence summary of the text. The five sentence summary graphic organizer will work for fiction or nonfiction text. Each portion of the template moves students through the content of the text. 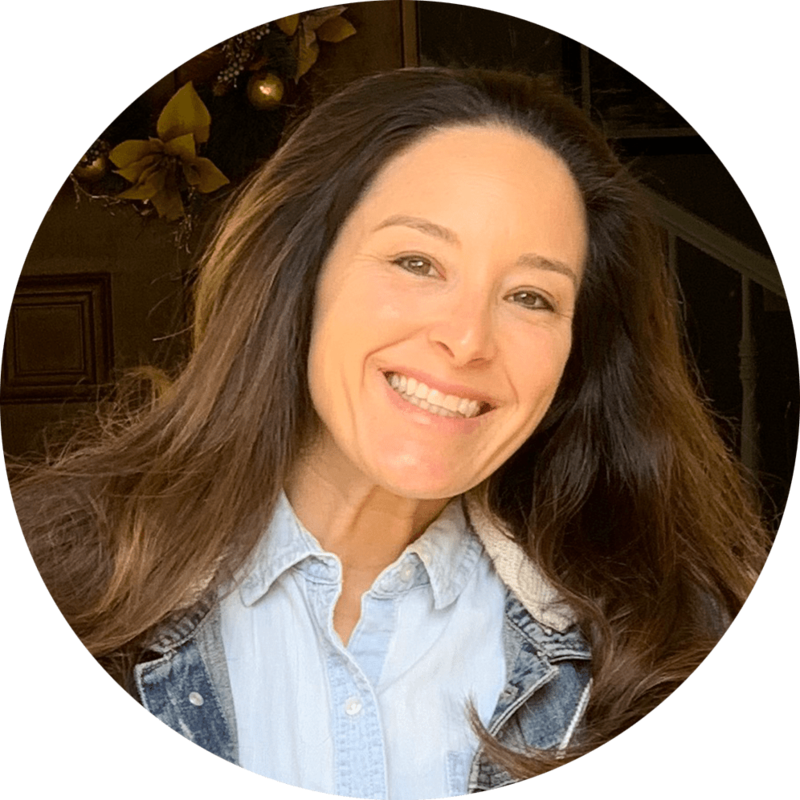 Students begin with the topic or main idea, record three important details or facts, and finish with the wrap-up or resolution. 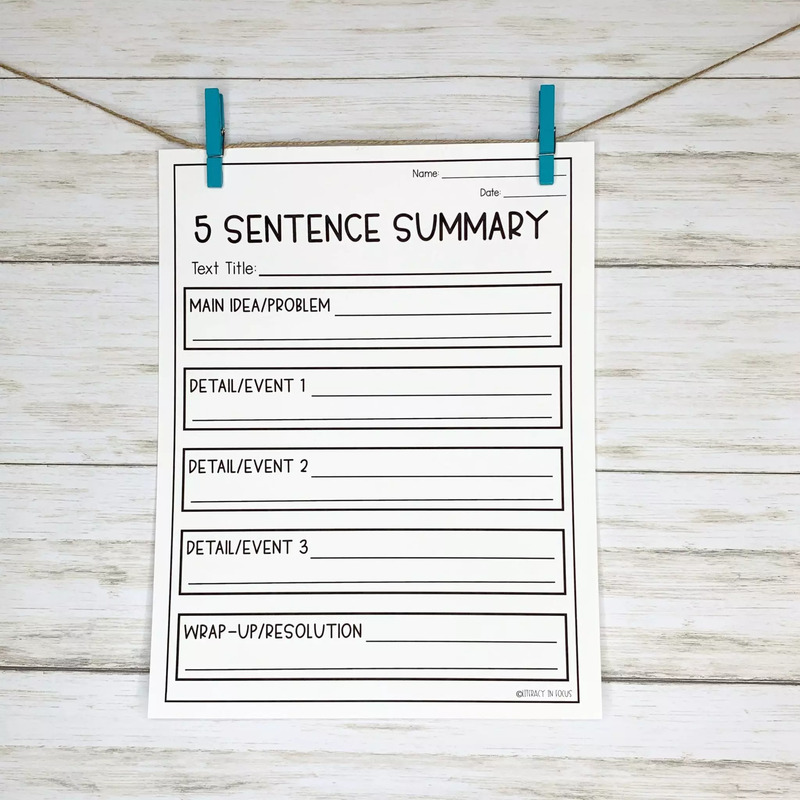 The five sentence summary works well for short pieces of literature or informational text. Summary writing doesn’t have to be a daunting exercise for you or your students. Using graphic organizers to guide students through the process will help tremendously. When it comes to creating each graphic organizer, there are typically three different options: students can make their own, you can provide pre-printed templates, or if you have access to technology, you can go the digital route. The end-goal of each type of organizer is the same, so use whatever best meets the needs of the students in your classroom. Looking to save time? 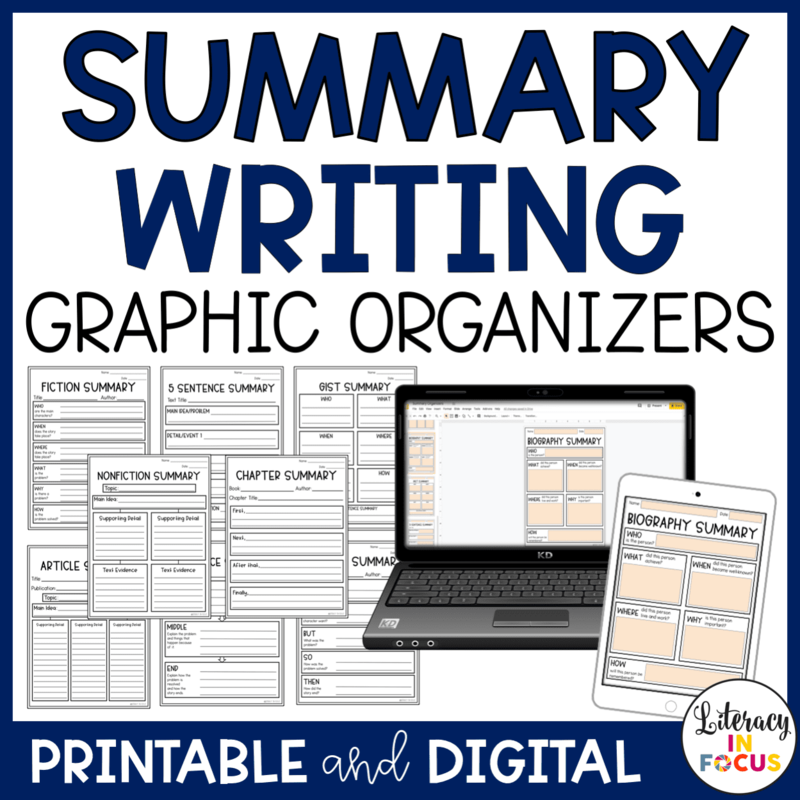 Click here to download all ten graphic organizers mentioned above in printable, editable, and digital formats from Literacy in Focus on TpT.